Ntabamoya is an exclusive property development within a private game reserve and eco-estate. It is located in the central Drakensberg area of KwaZulu-Natal, South Africa, a designated World Heritage site. There are only six sites remaining for sale at R499,000 each including VAT of a total of twenty five. In additon, should you wish to purchase a 1/25 share in the reserve itself the price is R399,000 including VAT. Sites have approved planning for construction of one 3 or 4 Bedroom Luxury house set in this private game reserve and eco-estate. Each house is located on the 0,4 hectares (1 acre) site and has all services including roads, electricity and water supply available. Mortgages are available from ooba. These are the last remaining houses to be built at this exclusive development. Completed houses may also be purchased using MortgageSA bond finance. Only twenty-five exclusive luxury houses are being built thus preserving space and privacy in this exclusive eco-estate property development. Fifteen houses have already been completed and the remaining houses are now being constructed for our exclusive clients. Municipal building inspector was very impressed with the local contractor's build quality. "This is the best build quality I have seen in years! Are you sure the price is correct?. "Your web site is great, but the development and reserve are absolutely stunning. A visit is a must!". Come and see the development for yourself or just enjoy the reserve‘s wildlife, birdlife and natural beauty. We also provide Bed and Breakfast accommodation at Ntabamoya. The houses are located in a 15-hectare (37 acre) development area near the centre of the 445-hectare (1092 acre) Private Game Reserve. Each house is set on a generous 4000m² (0,4 hectare or 1 acre) plot and is built and finished to a very high standard. This quality and value is unrivalled. Each house is constructed adhering to approved house plans to provide the very best quality houses. 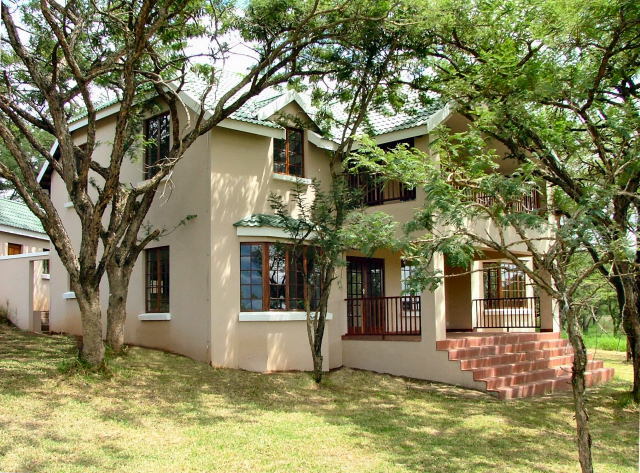 Each house comprises four bedrooms (two en-suite), bathroom, covered patio, veranda, balcony and hot tub. Ntabamoya is located in the central drakensberg between Champagne Valley and Cahedral Peak, 2½ hours from Durban and 3½ hours from Johannesburg; an ideal halfway vacation point. The game reserve is a photographer's dream. with an abundance of birdlife and wildlife set in natural acacia bush. It offers a walk and stalk experience that is secure, private and child friendly as well exclusive fishing rights for purchasers only1. There are also many attractions and things to do close to the reserve. Send details of this site to a friend via e-mail.